With a proven track record, TorGuard has evolved into a high-quality VPN provider for both beginners and advanced users. We here at The VPN Lab agree that it is one of the top 10 VPN providers currently available. The company runs servers in 50+ countries and provides good VPN service at reasonable prices. To begin using TorGuard, just download the appropriate app for your operating system and follow the installation guide. You can choose between TorGuard Lite and Torguard Viscosity. The first one is a simpler client software, ideal for first-time VPN users, whereas the latter is a better option for tech-savvy users. TorGuard Lite automatically connects the VPN after you have entered your information, meaning that you basically don’t have to do anything to securely browse the Internet. You can also manually select the server and protocol. Torguard Viscosity, on the other hand, allows for much greater customization. Both clients are easy to use and provide a user-friendly experience. Still, if you are not familiar with the way VPNs work, you should probably stick to the Lite version. 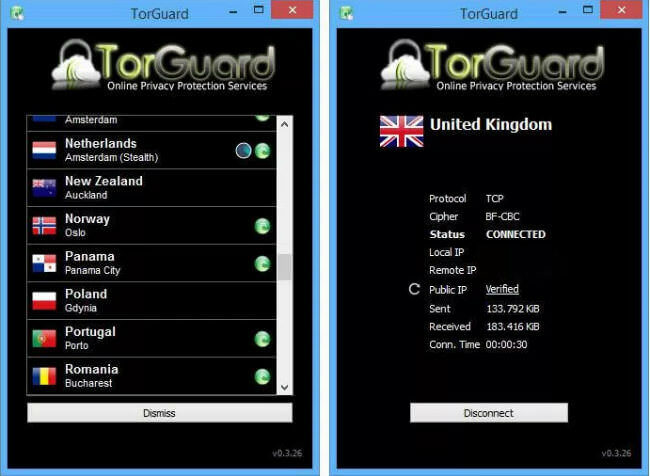 TorGuard advertises itself as the best VPN service for Torrent users who want to remain absolutely anonymous and safe in their online activity. In fact, their anonymous proxy service is specifically optimized for p2p filesharing and for bypassing geo-restrictions, such as watching Netflix or Hulu in places where those services are either blocked or unavailable. They have 3,000 servers in over 55 countries, including Saudi Arabia and Egypt. Australia is also represented, which is nice since this region often gets neglected. They boast unlimited speeds and switching, unlimited bandwidth, as well as anonymous webmail service for absolute privacy and anonymity, which is impressive, to say the least. The company also sells pre-flashed VPN routers. Speed is one of the areas where TorGuard prevails. When tested, the speeds proved to be very fast, ranging from good to excellent, very stable and reliable. Exceptional results were achieved through the UK and Netherlands servers, which is often the case with other VPN services as well. Of course, connecting to more distant servers brought slower speeds, but that’s why you always connect to the nearest server. We were pleased to see there were no DNS or WebRTC leaks whatsoever. For example, unlimited speed and bandwidth come with all TorGuard packages. Some of them even include unlimited mail storage. You also get a dedicated, fresh IP address just for you. There are over 3,000 VPN servers available in more than 55 countries of the world. They are all strategically distributed across the globe so you can rest assured that you will have one close enough wherever your travels might take you. The company was nice enough to put servers in Australia and New Zealand too, the region that has been so unfairly ignored by many VPN providers for too long. TorGuard has another interesting feature that not many other providers can boast – the stealth server feature. The “stealth” servers are ideal for countries and regions with web control, most notably China. Thanks to this feature, the residents of these areas can now enjoy the exact same content and access the same websites as anyone else anywhere in the world. TorGuard not only accepts but encourages P2P sharing. However, there are some things to keep in mind here. There are specific, dedicated servers that should only be used for P2P sharing. This is actually pretty smart since you can do all your P2P sharing on dedicated and specifically configured and maintained servers while the rest of the servers remain free for faster browsing and streaming. There are plenty of dedicated servers so you don’t have to worry about slow speeds on crowded servers. In addition, TorGuard also offers a specialized torrent proxy, which supports all major torrent clients (BitTorrent, uTorrent, Deluge, Vuse, and many more) and also comes with unlimited bandwidth. TorgGuard uses OpenVPN/SSTP/L2TP/IPsec encryption protocols. You can choose whichever you like, but most experts recommend using OpenVPN for maximum security. You can connect up to five different devices using one TorGuard account. This should cover all of your devices, from computers to smartphones. TorGuard does not keep any logs whatsoever so all your connections are 100% anonymous. Depending on the server you connect to, TorGuard uses either 256-AES or 128-bit Blowfish encryption. There is also a “stealth proxy” option available where you can connect to one of the ten dedicated servers through a Socks5 proxy tunnel which activates an additional level of AES-256 encryption. As for privacy, TorGuard doesn’t keep any logs. They do keep billing info, but you can bypass that by using BitCoin or, alternatively, providing bogus info. Customer support is another department where TorGuard does very well. Their website has an extensive support area with FAQ, knowledge base, troubleshooting, tutorials, forum and a support ticket system. You can also access support from the user account area. TorGuard offers the live chat option as well. The support staff is helpful, polite and friendly. The support ticket system also works very well, with responses coming in a matter of just a minute or two. 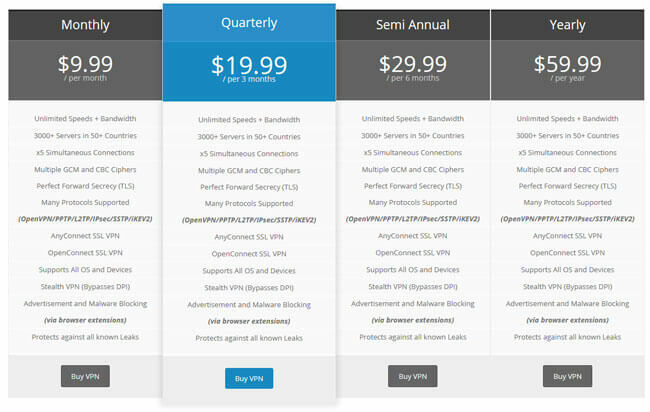 TorGuard offers four different subscription plans based on the length of the subscription. You can subscribe for one month, three months, six months or one year. The longer your subscription period, the higher the discount. The monthly plan costs $9.99, the quarterly subscription costs $19.99, and the semi-annual subscription costs $29.99. If you opt for the annual subscription, which costs $59.99, you will be paying just $4.99 per month (you will be billed the entire sum at once). TorGuard also offers a biannual plan for the most hard-core users at a price of $99.99 charged every 2 years. In addition to all major credit cards, TorGuard also accepts BitCoin, PayPal, Alipay, and UnionPay. Finishing off this TorGuard review, here’s a quick overview of the features that wowed us and the aspects of the service that could use some improvement. Our ratings are the result of an objective and independent evaluation of TORGUARD, generating the final rating that reflects the overall quality of the company. Ratings may change as the service changes. TORGUARD user rating based on 9 user reviews. It works great once you manage to install it. Please do something about those mobile apps, it’s a torture to make it work on a phone. I picked TorGuard because they are really serious about p2p and torrents. I need that kind of service because I do a lot of p2p sharing. Designated servers are a terrific idea. Good, affordable service that could use some improvement in the speed and reliability department. Everything else is very good. I loved the customer support at TorGuard. These folks here are professional, helpful and very polite. Nice job! Support is very quick. I’ve used live chat and support ticket, and they were both very fast. I have some issues with speed on certain servers, tho. It might take some time until you find the server that works for you, and when you do, I recommend you stick to it. We found 0 verified TORGUARD discounts for April, 2019. There are no TORGUARD coupons or discounts right now. Discover the full range of possibilities TORGUARD offers and become an advanced user in no time with our beginner-friendly TORGUARD guides. Whether you are interested in secure torrenting, unblocking Netflix, setting up TORGUARD on all your devices or you simply want to learn more about TORGUARD, you can find verified information and clear instructions in our TORGUARD guides below. Does TorGuard Keep Logs? - investigating the company’s logging policy and the impact of US legislation on its service.